So sweet. I had to login to Reddit just to upvote the rant and comment. Instead of reprinting the text, I screenshot it for justice. 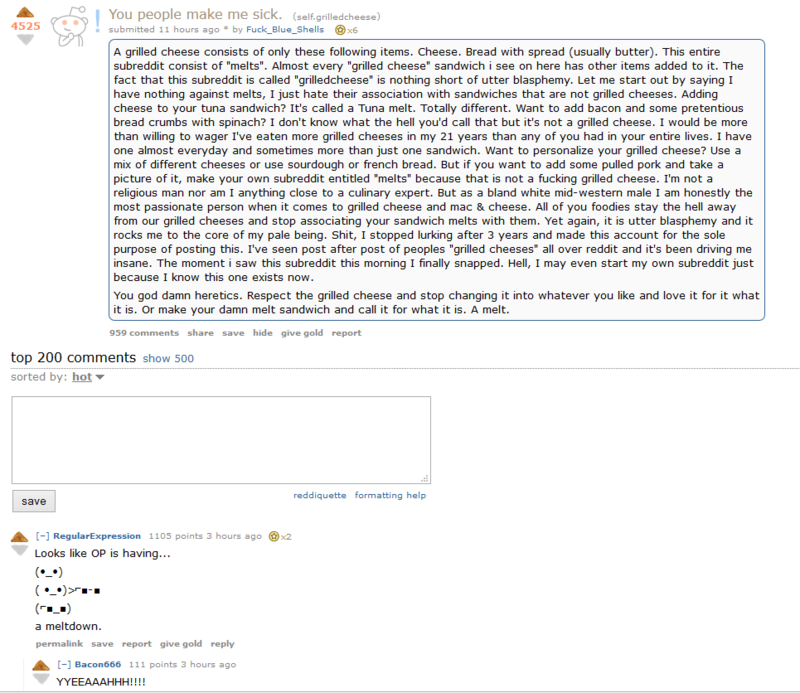 The basics of this is someone ranting, and rightly so, that a grilled cheese is ONLY bread and cheese. You add anything else and its a melt. Now one may argue that the single exception is a slice of tomato, but don’t tell OP that, he will jump down your throat. However, its not the rant that is gold, but the first comment and reply. And now, the screenshot. Yes, its small, click on it to make it large, or just read the post. BTW, I’m guilty too as soon here in ‘how to make the perfect midnight grilled cheese‘.